In the midst of an exceptional season for Salt Lake City’s dance and ballet companies, this week’s forthcoming ‘Reunion’ concert (April 23-25) by the Repertory Dance Theatre (RDT) will remind the community of why dance enjoys an amazingly diverse and nationally recognized presence in the Utah arts scene. In 1966, the Alvin Ailey American Dance Theater in New York City was the only dance company in the United States that occasionally featured works by choreographers other than Ailey but those works also bore his distinctive artistic mark. A repertory dance theatre functioning as an “artistic democracy” in which works from the history of modern dance choreography would be performed periodically along with new works by various choreographers was “a revolutionary idea” at the time, Linda Smith, RDT’s artistic director and co-founder, says. Others had tried the repertory concept but they failed for various reasons. There was the lack of stable revenue or sound business management. The flourishing art of modern dance also brought forward a generation of innovative choreographers, many of whom desired to stay clear of works from previous chapters of modern dance’s history, some dating to 1915 or even earlier. 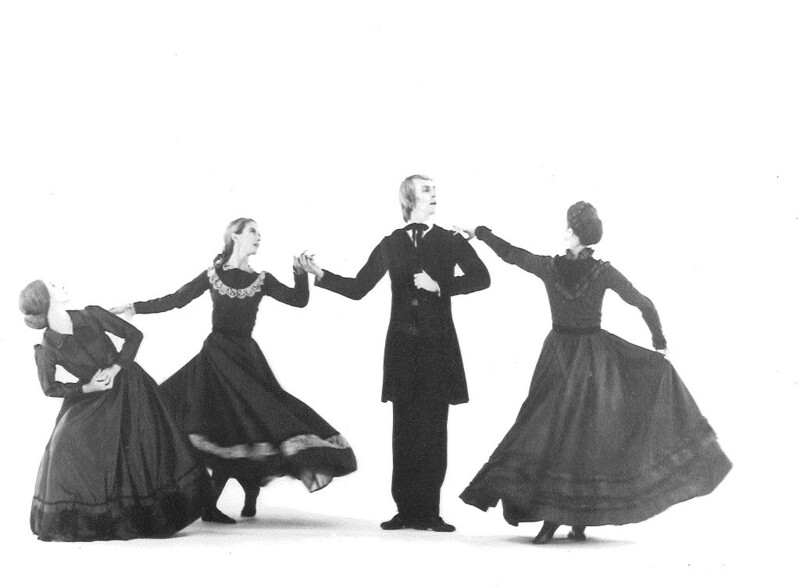 Kay Clark (center) in ‘Age of Innocence,’ choreographed by Ethel Winter. Also featured are Gregg Lizenberry and Bill Evans, Clark co-founded RDT with Linda Smith. In 1966, bypassing the nation’s largest metropolitan venues for the performing arts, the Rockefeller Foundation contacted Smith, offering a grant to start a professional repertory dance company that would not be committed to a singular aesthetic vision of modern dance but which instead would function as a living, fully egalitarian archive of the whole choreographic output of this performing arts genre. There would be no leader for the eight original artists of RDT who would be the pioneers for articulating what a living repertoire of modern dance should constitute, as reflected in their performances which included tours in a program sponsored by the National Endowment for the Arts. Angie Banchero-Kelleher, one of the choreographers featured at the RDT’s ‘Reunion’ concert. To close out its 49th season and to make the bridge to next season’s 50th anniversary celebration, RDT’s ‘Reunion’ concert is an artistic homecoming of sorts, featuring eight short dance compositions representing each decade of the company’s existence. “We have had nearly 100 dancers come through the University of the RDT and we think the program offers a good broad sample of our history,” Smith says. Including two world premieres, all of the works are by RDT dancers and choreographers. Three performances of ‘Reunion’ will take place April 23, 24, and 25 at 7:30 p.m. in the Jeanne Wagner Theatre of the Rose Wagner Center for Performing Arts. Calling the program selection a “full menu for a movement feast,” Smith says it reflects RDT’s mission that she says is still revolutionary. “There is no one single person’s aesthetic which is dominating the show. Each piece is as different as the next,” she adds. Some have a whimsical, even pop culture feel, while others hint at vaudeville or simple hi-jinks. Others highlight abstract movement in a way that resonates comfortably for audiences. Linda Smith (center) from 1968 RDT performance in ‘Back to Back,’ choreographed by Bill Evans. Smith is the co-founder of RDT, which will celebrate its 50th anniversary next season. There are nostalgic personal tributes, one of which uses a familiar Schubert impromptu the choreographer remembers as a favorite piece of his grandmother that incorporates movement vocabulary from both modern dance and ballet. Another is a tribute in dance metaphor – incorporating bold movements that convey both hesitation and confidence – honoring a choreographer’s late mother and the intellectually challenging, yet emotionally rewarding relationship they enjoyed. There’s pop music, a Good Housekeeping exercise recording from the 1970s when dance aerobics were introduced, classical music ranging from Bach to the late 20th century, and even Georgian folk songs. 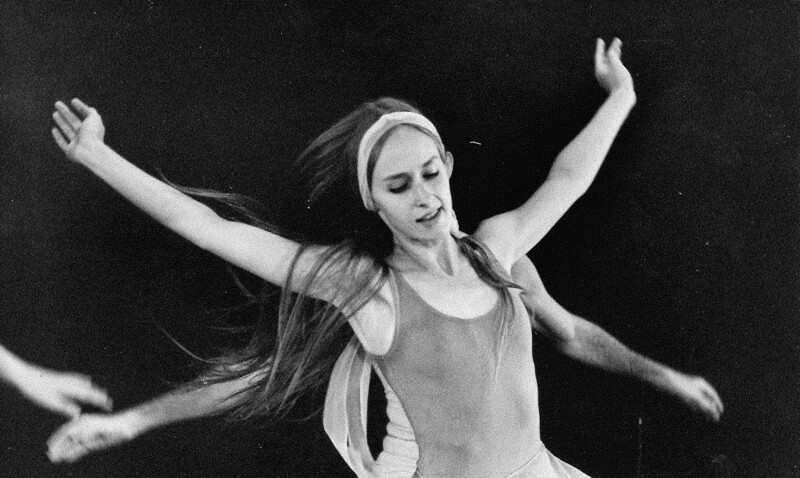 Lynne Wimmer in ‘For Betty,” choreographed by Bill Evans. Wimmer’s own work ‘Styrofoam Olympics’ will be performed at the RDT ‘Reunion’ concert. Representing the 1990s in ‘Reunion’ is Francisco Gella, whose outstanding career as a dancer and choreographer has traversed the fields of modern dance and ballet in many of the nation’s best known performing arts settings. A winner of many awards for his choreography, Gella’s interpretation of one of Schubert’s eight Impromptu pieces is a world premiere piece for two dancers. Former RDT dancer Nathan Shaw, whose new work ‘Whistle Stop’ will be performed at the RDT ‘Reunion’ concert. Gella, who still has ties to Utah with dance workshops and artist residencies, says he will always be grateful for the roles Smith entrusted him to perform. These included works by internationally known choreographers who are essential to the dance archive RDT has created, including Bill Evans, David Parsons, Lynne Wimmer, Elizabeth Waters and others. He considers his most memorable RDT performance to be the 1998 full-length premiere of ‘Chairs,’ choreographed by Zvi Gotheiner, the founder of the Israeli Chamber Dance Company who has created new works for RDT since 1993, including ‘Bricks’ which helped the company mark its 40th anniversary season in 2006. Indeed, ‘Chairs’ electrified the community both among dance artists and audience members, and every performance sold out the house in the Rose Wagner Center for Performing Arts. BilL Evans, one of RDT’s original performers and choreographers, created ‘The Legacy’ in 1972. Recently in an interview with The Utah Review, Gella still speaks with sincere excitement about the experience from 17 years before that he says truly captured the whole fascinating artistry of dance. ‘Chairs’ was a full-length evening performance piece, running more than an hour, with two male dancers in a phenomenal display of stamina that starts with the simple premise of sitting in a chair. “It was very controversial at the time because there was this small chair, very close boundaries, and two male dancers were in a duet atop this chair,” he recalls, adding that he still remembers watching audience members leave who were uncomfortable with the breach of intimate boundaries between two men. Shortly after that landmark performance, Gella moved to Philadelphia Dance Company and performed with the Chamber Dance Company, Seattle Opera. California Ballet and Ballet Pacifica. His credits as choreographer are lengthy. His work for South Bay Ballet entitled ‘Configured Echoes’ garnered a best choreography award at the National Regional Dance America Conference. His ‘Tango en Pointe’ solo was performed for the Presidential Scholar’s Gala held at the Kennedy Center. The RDT experience prepared him as well for his work as a teacher and mentor, as he has created several award-winning contemporary solos for Youth America Grand Prix competitors. Many of RDT’s nearly 100 alumni dancers came to the company on as many different paths. One was Angie Banchero-Kelleher, who did two stints as a dancer with the company, first from 1985 to 1992, and then again from 1998-2007. Now associate professor of modern dance at Utah Valley University, Banchero-Kelleher will see her 2014 work ‘Material Tokens of the Freedom of Thought’ presented as the closing work on the ‘Reunion’ concert. For Banchero-Kelleher, who had given up a dance scholarship at the University of Utah to major in history and then return to dance through RDT workshops, RDT proved to be her crucible. “I grew up with the RDT and I learned at the foot of the master,” she recalls. Unlike Gella, much of Banchero-Kelleher’s earliest RDT experiences were in the old army barracks at the University of Utah campus where scores of students, including many who were not necessarily destined to be professional dancers, paid to take six-week summer workshops in the art. Although RDT received some modest in-kind support from the university and many of its dancers were trained in the school’s dance department, the company operated independently, just as the Rockefeller Foundation had intended nearly two decades before at RDT’s founding. By the time Banchero-Kelleher had finished her first stint with the company, the barracks had been demolished and RDT moved into temporary headquarters in downtown Salt Lake City. In 1997, just right before she began her second stint with the company, RDT had a new home in the Rose Wagner Center for the Performing Arts. However, for Banchero-Kelleher, the clearest and most important memories are of the works and their choreographers. “RDT was and is populated by the giants of the field,” she says. The repertory archive had grown from the early works of choreographers such as José Limón, Anna Sokolow and Donald McKayle and those of independent artists – the bread-and-butter of RDT’s unique ‘artistic democracy’ – including John Butler, Geoffrey Holder and Glen Tetley. Banchero-Kelleher remembers clearly works such as Laura Dean’s ‘Sky Light’ and the early masters including Merce Cunningham and Doris Humphrey. Not including intermission, the ‘Reunion’ concert runs under 75 minutes, with works lasting between six and 13 minutes. Other works include the opening piece, an RDT classic, ‘For Betty,’ a work choreographed for a 1970 premiere by Bill Evans, who danced with RDT from 1967 to 1974. Accompanied by music by Vivaldi, the work of abstract movement heavily influenced by geometric shapes and form is a tribute to Hayes, who taught for more than 48 years and was chair of the University of Utah’s dance program. a piece by Shapiro and Smith for the Repertory Dance Theatre. Gella’s newest work “Schubert Impromptu’ will be presented at the RDT ‘Reunion’ concert. Wimmer’s 2008 work, ‘Styrofoam Olympics,’ featuring the great Glenn Gould recording of Bach’s Goldberg Variations transcribed for piano, is a classic theme and variations composition inspired by an exercise those recovering from knee injuries would be asked by their physical therapists to perform. The exercise required the patient to stand on one leg and pick up a set of Styrofoam cups. Representing the 1970s are two pieces from RDT’s co-founders. Smith, who has a flair for straightforward humor, offers her own ‘Snack Pack,’ a dance commentary on the introduction of dance aerobics into group exercise which became popular during that decade. Smith incorporate a large soft sculpture in the style of contemporary pop artists such as Claes Oldenburg. Kay Clark, who was with RDT from its inception to 1983, is represented by ‘Odd Couple,’ a 1977 work featuring folk songs from the old Soviet Union republic state of Georgia. The piece fuses two inspirational sources: experiences Clark had during a performing tour of the Soviet Union and the work of photographer Diane Arbus which featured New York City images. In addition to Gella’s world premiere, Nathan Shaw, who danced with RDT from 2006-2012, will have a new work titled ‘Whistle Stop,’ a sure-to-be audience pleaser with popular music. Shaw, the reigning winner of RDT’s annual Iron Choreographer competition, is a full-time dance teacher at Judge Memorial High School in Salt Lake City. Another work is ‘Alone,’ a 2006 work by Brent Schneider, who danced with the company from 1989 to 1994. The work, featuring music by Górecki, is scored for a solo dancer who then is accompanied by four other artists. RDT Dance presents REUNION from RDT on Vimeo.